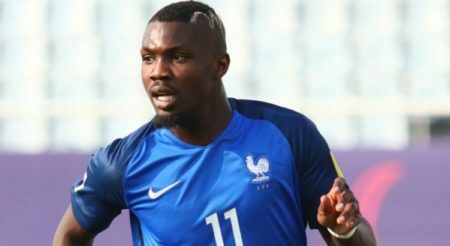 Manchester United are monitoring the progress of young French forward, Marcus Thuram. The 21-year-old has impressed in the French Ligue 1 this term, scoring 10 times in 17 games and is being linked with a move away from his club, Guingamp. The player, who is the son of French football legend, Lilian Thuram has been a target for Arsenal and Tottenham, though The Sun (h/t Daily Express) report that Manchester United sent scouts to watch him in last weekend’s defeat by Saint Etienne. Despite being on the losing side, he showed enough endeavour and quality which might lead to a formal bid sooner rather than later from the Red Devils. The Sun further reports that Arsenal and Tottenham also had club scouts watching him in the game. United have impressed recently under the management of club legend, Ole Gunnar Solskjaer, with the Norwegian leading United to a sixth consecutive victory since the sacking of Jose Mourinho in December. The Red Devils won what was arguably the toughest game in the Solskjaer era with a 1-0 win over Tottenham with Marcus Rashford scoring the winner, with David de Gea performing heroics at the other end to keep Spurs at bay. United need another striker to help shoulder the burden of goalscoring, and Thuram fits the bill perfectly. He is tall, physically imposing, can dribble and is very good with his head. It is believed that might be interested in a move to Old Trafford, though it is too early to say whether United will make a move for him this winter or in the summer.